Baked Eggs and Asparagus with Parmesan cheese recipe is a perfect dish for brunch. Simply adjust the cooking time to get eggs cooked to your liking. This recipe is from The Sunset Cookbook circa 1960. Barbara has a stack (probably two or three) of old vintage cookbooks that she uses for inspiration as she works on recipes to fix for her family and to share on the blog. Our mom gave her this cookbook for Christmas and she is never disappointed in the recipes inside. Asparagus is a favorite vegetable in our family. Isn’t it funny how you can HATE a food as a child and LOVE it as an adult? That’s asparagus for all four girls in our family. Our mom had to force us to eat it as kids but we fight over every last stalk grown at both farms during the summer. The asparagus patch at Barbara’s (originally our grandparents’ farm) is decades old and still produces each year. My dad planted a long row of asparagus at our parents’ farm several years ago and it now produces a nice crop too. This is the perfect recipe for brunch. You can eat the eggs and asparagus alone or serve it over toast. Don’t like your egg yolks runny? Just modify the cooking time for your favorite style of eggs – runny, partially runny or completely cooked. Wash and dry asparagus; cut into 1 inch pieces, discarding woody ends. Heat olive oil in a large frying pan over medium heat; saute asparagus and onion until asparagus is crisp-tender, approximately 5 minutes. Pour in water; add salt and pepper. Cover and cook over medium low heat for 10 minutes. Remove cover; break eggs into a small bowl, one at a time, and slide out on top of asparagus (try not to break yolks). Bake, uncovered, at 375 degrees F for 8-10 minutes, or until the eggs are set as you prefer. Eat alone or serve over buttered toast. 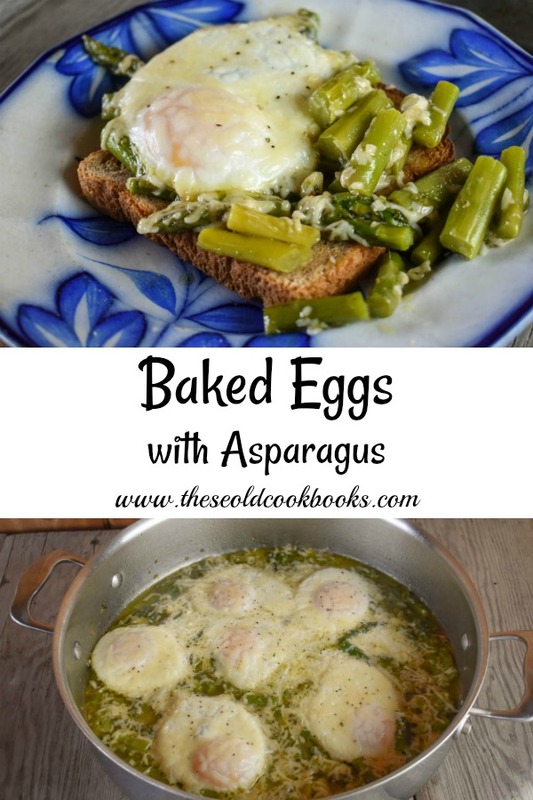 I love baked eggs and love adding asparagus in the spring! Such a good classic recipe! I’m all about the asparagus!